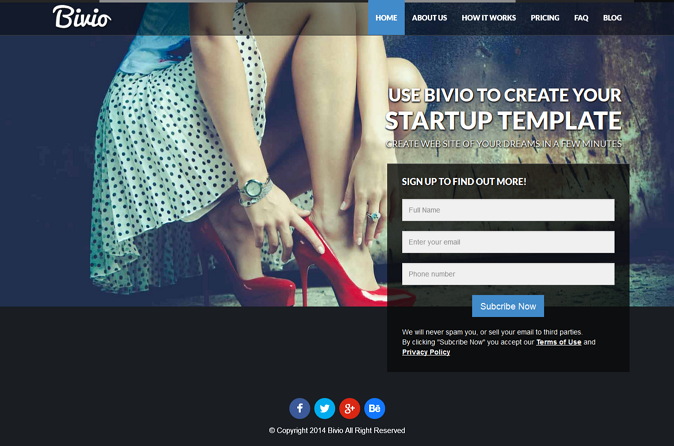 Bivio is an Bootstrap 3 App Landing Page WordPress Theme it’s an advanced and powerful premium WordPress theme suited for startup / landing page websites, personal, blogs or business websites. Using it, you can create the web site of your dreams in a few minutes for example it can be used to promote web services or launching startups. This is a WordPress theme with unique features and well-structured code. Bivio is powered with Twitter Bootstrap v3.1.1 and Font Awesome v4.1.0 Framework. It’s fully responsive, and looks stunning on all types of screens and devices (desktop, notebook, tablet and mobile), it’s flexible, clean, with a professional design and Search Engine Optimized. Parallax Background Effects – This theme has the parallax feature built in.So, if you like the parallax effect, you can use it to create awesome Parallax Background Fullscreen Effects for any content page. Item Reviewed: Bivio Bootstrap 3 App Landing Page WordPress Theme 9 out of 10 based on 10 ratings. 9 user reviews.